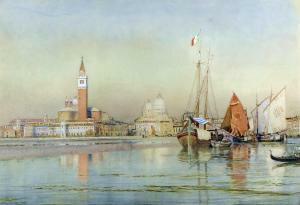 Find artworks, auction results, sale prices and pictures of Arthur Severn at auctions worldwide. 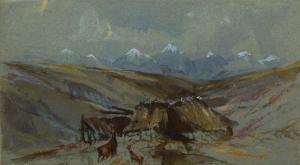 Joseph Arthur Palliser Severn RI ROI, British 1842-1931- Alpine landscape with goats; watercolour heightened with white on blue tinted paper, 18x33cm Provenance: with Heather Newman Fine Quality Early English Watercolours, Gloucestershire, according to the label attached to the reverse of the frame Note: Joseph Arthur Palliser Severn was a friend of John Ruskin, who left his Brantwood home to Severn upon his death in 1900.
signed and dated l.l. 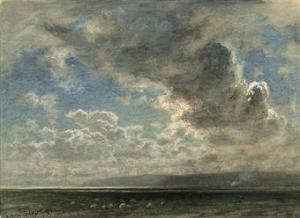 : Arthur Severn - 1887. 40.5 by 60cm., 16 by 23½in. The sheet does not appear to be laid down, undulates very slightly. Two lines of discolouration related to the frame along the upper and right edges, otherwise the work appears in good overall condition. 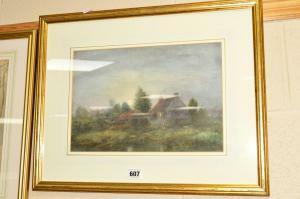 Held in gilt composite frame under glass; unexamined out of frame. 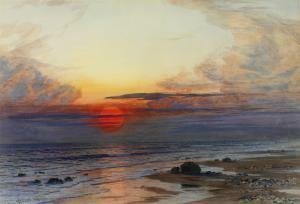 Joseph Arthur Palliser Severn was a friend of John Ruskin (1819-1900), the famous author, critic and artist, whose niece he married in 1881, and with whom he had visited Italy in 1872. Perhaps his most famous work was a portrait of Ruskin as an old man, painted in 1897.